Store at 4 degree C or at -20 degree C if preferred. Storage in frost-free freezers is not recommended. This product should be stored undiluted. Avoid repeated freezing and thawing as this may denature the antibody. Should this product contain a precipitate we recommend microcentrifugation before use. Shelf Life: 18 months from date of despatch. Small volumes of anti-F8 antibody vial(s) may occasionally become entrapped in the seal of the product vial during shipment and storage. If necessary, briefly centrifuge the vial on a tabletop centrifuge to dislodge any liquid in the container`s cap. Certain products may require to ship with dry ice and additional dry ice fee may apply. 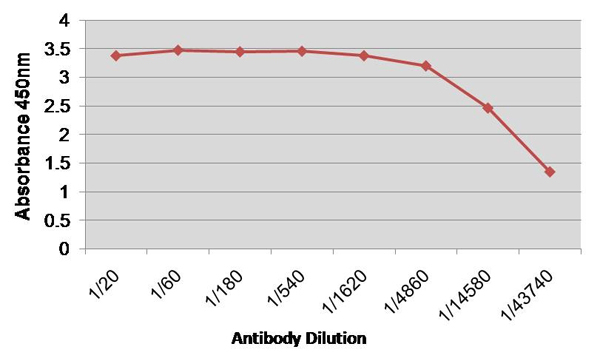 Mouse anti Human Factor VIII antibody, clone RFF-VIIIC/5 recognizes human Factor VIII, an essential blood coagulation factor. Whilst circulating in the blood, it is mostly stably complexed to von Willebrand factor. It is activated through cleavage at various sites, dissociates from the complex and interacts with Factor IXa, in the presence of calcium ions and phospholipids, to convert Factor X to the activated Factor Xa, which activates thrombin. Thrombin cleaves fibrinogen into fibrin, which polymerises and cross-links to form a blood clot. The activated Factor VIII is proteolytically inactivated and cleared from the bloodstream. Defects in Factor VIII cause haemophilia A, a disorder characterised by the body's inability to control blood clotting. This could result in severe blood loss, even with minor injuries. Mouse anti Human Factor VIII antibody, clone RFF-VIIIC/5 recognizes an epitope towards the C-terminus of full-length Factor VIII. It also recognizes the 80kDa and 70kDa cleavage products. NCBI/Uniprot data below describe general gene information for F8. It may not necessarily be applicable to this product. F8: Factor VIII, along with calcium and phospholipid, acts as a cofactor for factor IXa when it converts factor X to the activated form, factor Xa. Defects in F8 are the cause of hemophilia A (HEMA). A disorder of blood coagulation characterized by a permanent tendency to hemorrhage. About 50% of patients have severe hemophilia resulting in frequent spontaneous bleeding into joints, muscles and internal organs. Less severe forms are characterized by bleeding after trauma or surgery. Of particular interest for the understanding of the function of F8 is the category of CRM (cross-reacting material) positive patients (approximately 5%) that have considerable amount of F8 in their plasma (at least 30% of normal), but the protein is non- functional; i.e. the F8 activity is much less than the plasma protein level. CRM-reduced is another category of patients in which the F8C antigen and activity are reduced to approximately the same level. Most mutations are CRM negative, and probably affect the folding and stability of the protein. Belongs to the multicopper oxidase family. 2 isoforms of the human protein are produced by alternative splicing. 1. Translation of the F8B gene comprising F8 exons 23-26 may be dependent on the position of the premature stop codon and thus contributes to the immune response of truncated FVIII proteins.